Manager Mickey Callaway had to first insert Tyler Bashlor before bringing in Wheeler because Bashlor already was warming as Matt Harvey’s pitch count was rising. LAKE BUENA VISTA, Fla. — Zack Wheeler was supposed to follow Matt Harvey to the mound in Wednesday’s 6-4 Mets victory over the Braves at Champion Stadium. But the reluctant reliever actually came in to start the fourth inning after Harvey’s two-inning stint. As if not starting a game wasn’t unusual enough for Wheeler, he had to wait until Tyler Bashlor pitched the third. Manager Mickey Callaway had gotten up Bashlor in the second when Harvey’s pitch count was rising. Callaway’s rule is if a guy gets up, he has to get in, even if it means Wheeler had to wait for a minor leaguer. Wheeler only threw one inning. He allowed a run when he bounced a pair of curveballs (starting with a runner on second) for consecutive wild pitches. He struck out two. 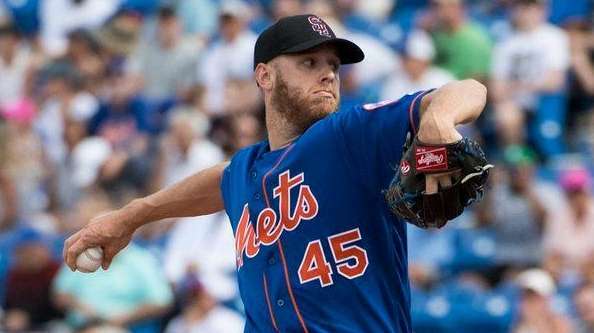 Wheeler, who threw one inning in a start in the Mets’ spring training opener, was supposed to go two on Wednesday. But he threw 25 pitches in the fourth and finished by throwing 13 more in the bullpen. The bullpen, by the way, is where Wheeler does not want to start the season. But the Mets have a six-pack of starters, and something will have to give if everyone is healthy on March 29. Brandon Nimmo hit a solo home run in the fourth inning . . . Tim Tebow entered as a pinch hitter to big cheers in the fifth and wowed the crowd with a deep fly ball to center. Tebow later wowed the crowd by grounding into a double play. He is 0-for-4 . . . The Mets had no update on Anthony Swarzak, who injured his left calf on Tuesday and was scheduled for an MRI on Wednesday.